Two cleaning steps in one! Save time with the RolliBot 2-in-1 microfiber mop head designed especially for the Rapido Corded Vacuum Cleaner. Our floor mop arrives assembled so you can clean as soon as you open the box. Save yourself the time reading the instructions. Simply attached the 2-in-1 mop accessory into the extension tube to begin the easiest floor cleaning process. Sweep, vacuum, and mop all your hard surface flooring from hardwood and linoleum to marble and tile. 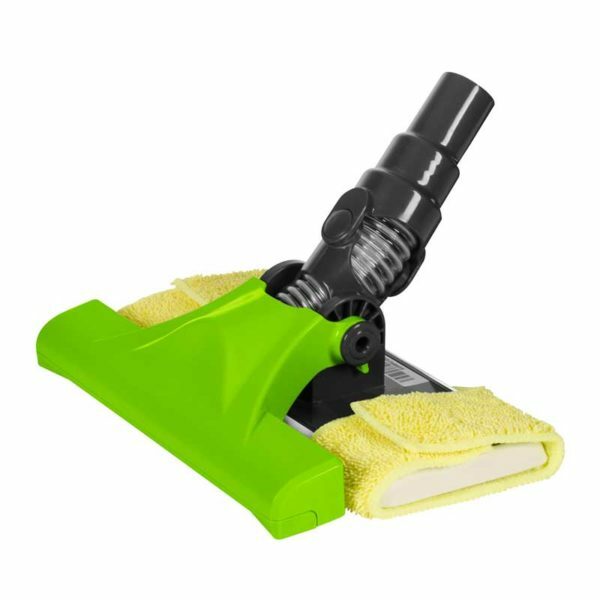 We have included all the necessary accessories like a microfiber pad for mopping and a floor tool to promote maximum suction when using the RolliBot Rapido Corded Vacuum Cleaner. Save yourself an extra step by mopping and vacuuming simultaneously. The floor tool takes care of the mess, removes stains, collects debris, and even polishes hardwood. Simple sweeping is optimized too! Replace the microfiber with your preferred brand of paper towels and watch as you capture even the smallest piles in minutes. You can also use the wet mop to reach deeply into the corners for a comprehensive clean like no other product. Transform time-consuming floor chores into painless cleaning that will make you feel good about your efforts using the RolliBot 2-in-1 Microfiber Floor Mop for the Rapido Vacuum!